The Green Bay Packers got down to the 53 player regular season roster limit on Saturday by releasing former second-round pick (QB) Brian Brohm. 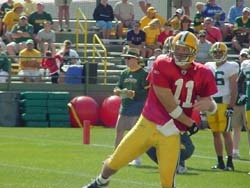 The release comes less than a year and a half after the Packers used a second round draft pick (No. 56 overall) to take him in the 2008 draft. Brohm struggled through much of training camp, but seemed to be showing improvement of late. But the Packers must not have felt he made enough progress or showed enough promise to keep him around for another season. It boils down to the Packers making a mistake drafting Brohm where they did. Releasing a second round draft pick before he even enters his second season is a monumental draft blunder. Yet give the Packers credit for not hanging on to a player that they feel will never make the grade for them in the NFL. There is still a chance Brohm could clear waivers and return to the Packers on their practice squad, but that scenario seems unlikely. The Packers also released wide receiver Ruvell Martin (pictured), a player who had been their 5th receiver on the roster for the last three years. They also released safety Anthony Smith, who appeared to be pushing for a starting job at times in training camp. The Packers paid Smith a $100,000 signing bonus as a free agent in the off-season. Also released were running backs Kregg Lumpkin and undrafted RB Tyrell Sutton, who made a strong bid for a spot on the 53 man roster. Sutton led the Packers in rushing during the preseason, compiling 191 yards for a 4.8 yard per carry average. The Packers released WR Jake Allen, CB Trevor Ford, G/T Andrew Hartline, WR Kole Heckendorf, LB Danny Lansanah, DE Alfred Malone, T Jamon Meredith, NT Dean Muhtadi, LB Cyril Obiozor, CB Joe Porter, T Dane Randolph, DE Ronald Talley and NT Anthony Toribio. Defensive end Justin Harrell, CB Pat Lee, TE Evan Moore and S Charlie Peprah were all placed on season ending injured reserve. In all, the Packers released 18 players and placed four on injured reserve. They also traded offensive tackle Tony Moll to Baltimore for defensive back Derrick Martin. Martin gives the Packers more versatility at both corner and safety and is a strong special teams player, a reason why he’s in Green Bay and Anthony Smith was released.